I love her! She’s such a nice person and I like the fact she talks about real things and how she genuinely feels about them. It’s like she doesn’t have thousands of subscribers, but just likes chatting away to herself to a camera! Her innocence is so admiring! Ive divided my tag with two products with one high end and the other low end! So you get a feel for both ends of the spectrum! Low end is Sleek Au Naturel palette and I’ve swatched my favourite colours! 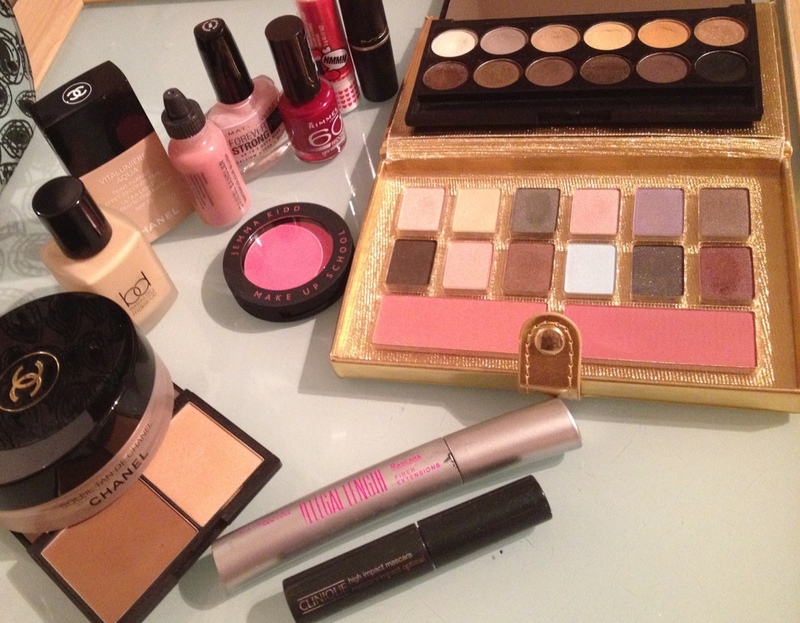 Most of these colours are matte however, there are some gorgeous shimmery colours! As usual.. Sleek has managed to make some colours a bit too chalky such as the buttery yellow at the top and this means it has excessive fallout but generally the colours are gorgeous and you can use this palette day and night! 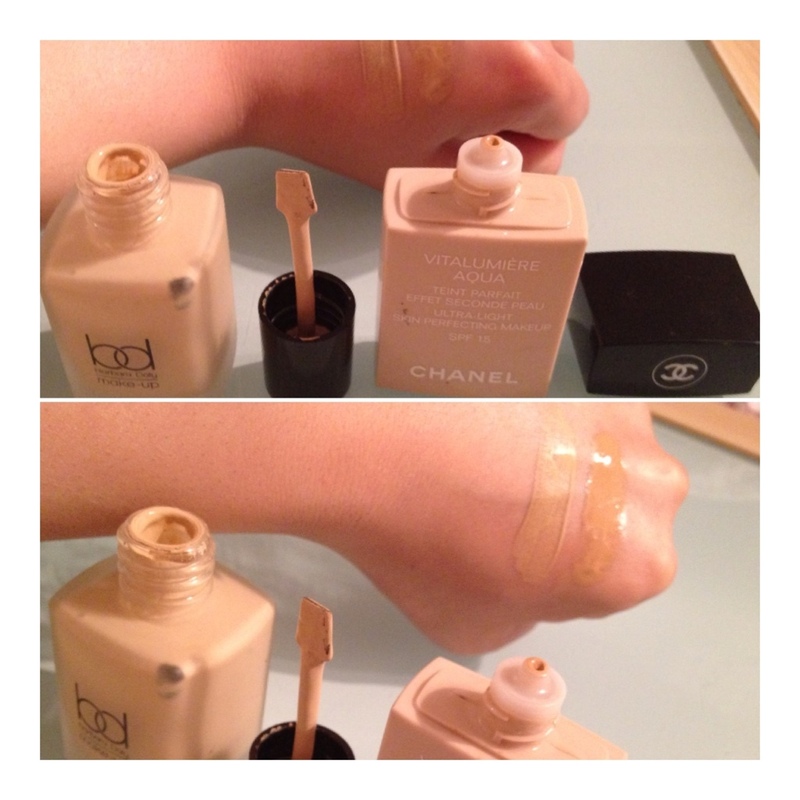 Too tip* to check the quality of a product, swatch the darkest colour in the palate to check its pigmentation! This gives you some knowledge about how vibrant the colours are and whether they apply the same colour as they appear in the packaging! Just look at that black in the Sleek palette! IT’S ASTONISHING! 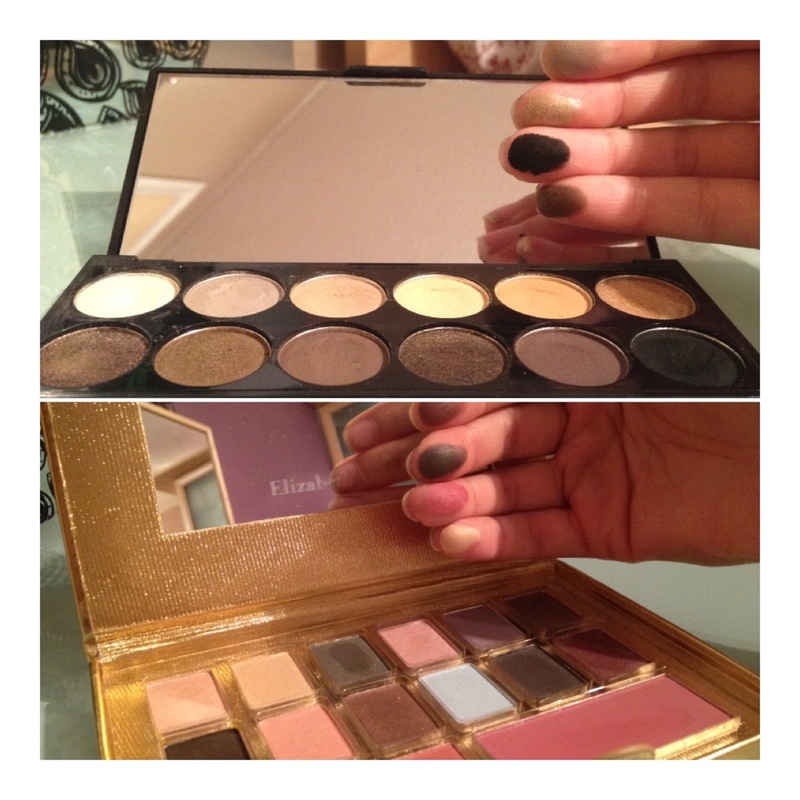 The Elizabeth Arden palette is one I got in a gift set but I can’t rave about this product enough! I love the colours! I love the finish! I love the texture! I would never buy eye any shadows that cost more than £6 for 1 shade because of what sleek has done for me (you get 12 colours for £6.49), but this was in a set with loads of other products! The first is actually an eye shadow colour by collection 2000 (now just Collection)! It’s in the colour Viva Vegas 06 and I LOVE IT! It’s a bright vibrant hot pink with purple and blue undertones! This is what got me into purple! It looks fantastic on the cheeks and yes it’s safe to use on cheeks! (Anything you can use on your eyes can be used on cheeks too). It looks great for a pop of colour if used with a heavy hand and gives a gentle flush with a light hand! I think it’s versatile! No matter what colour your skin is, this blush will look amazing on your beautiful face! The Body Shop lip smackers are amazing! I have always loved Body Shop lip products like the tubs of lip balm (especially strawberry) but I like this more because it’s a tube! The flavour is incredible! My favourite is Pomegranate and especially because it leaves the most amazing red tint to your lips! It’s moisturising and lasts on your lips along time! I get so many compliments when I wear this because it looks good and smells good.. Sorted! 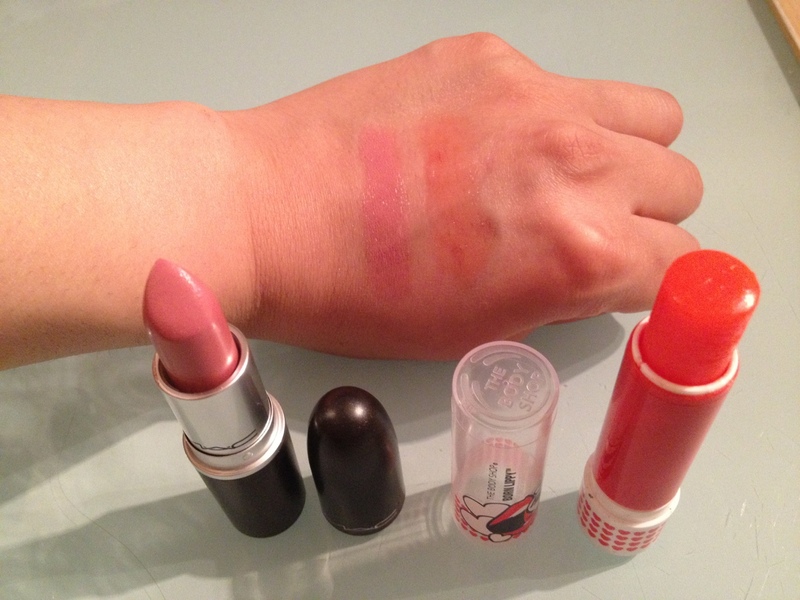 MAC lipsticks.. Need I say more! The shade Angel is no given and is probably one of MAC’s most popular lipsticks! Not least because Kim Kardashian wears it too and naturally, I love anything she wears! This has a lovely creamy formula and I LOVE THE SMELL! It drives me insane because it reminds me of something I used to love as a kid but can’t put my finger on the smell.. Hmmmmm! Anyway.. This shade.. I love it! 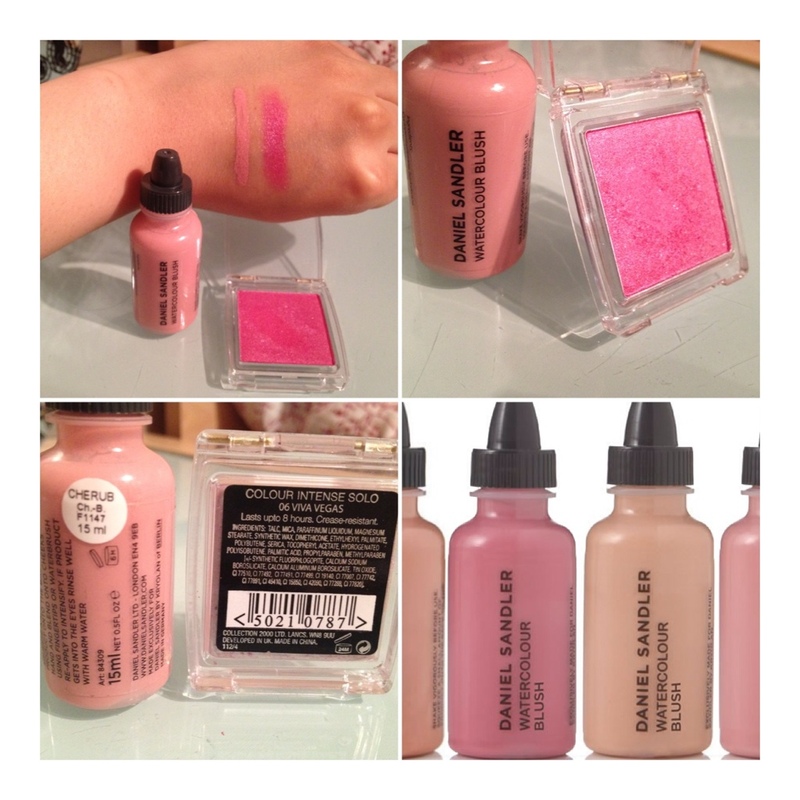 It’s a rosy pink but not too bright so is very wearable.. Lasts all day.. Looks great! You cant get more value for money than the Sleek Contour kit and especially because you get two products in one! The contour colour is excellent because it’s not too muddy so for all the pale people out there who don’t want to look orange, it’s definitely the one for you! As well as that.. They have it in three shades.. Light, medium (which I use to darken up a bit) and dark (which could probably could be darker to be honest)! It’s got a fantastic highlighter in it too and I love the shimmer.. Even though I’m not usually keen on shimmery bronzers! Chanel Soleil Tan de Chanel! You knew it was coming! I love using this bronzer with my Real Techniques Contour Brush in the hollows of my cheeks.. BEFORE applying my foundation! Sometimes this can look orange and I don’t want to look Tango’d so this is a method that works for me but this is definitely a must try product! Get a sample if you can because it lasts ages an you can then find an application method which suits you.. And it’s universal for any skin tone.. BONUS! I don’t really own high end nail varnishes so I just chose two of my favourites! I love the Maybelline one because it’s such a beautiful colour and lasts for AGES on my nails! I’m quite a hands on person (leave out the dirty jokes ;)), so I like my nail varnishes to last long! This is the perfect pastel link that can be worn in Spring, Summer and even for a light flush of colour in Winter! The Rimmel colour is one of my favourite reds! It lasts ages on my nails, dries in less than 60 seconds, I find and I think it’s perfect for Autumn, Winter and with a bit of nail art, Summer too! 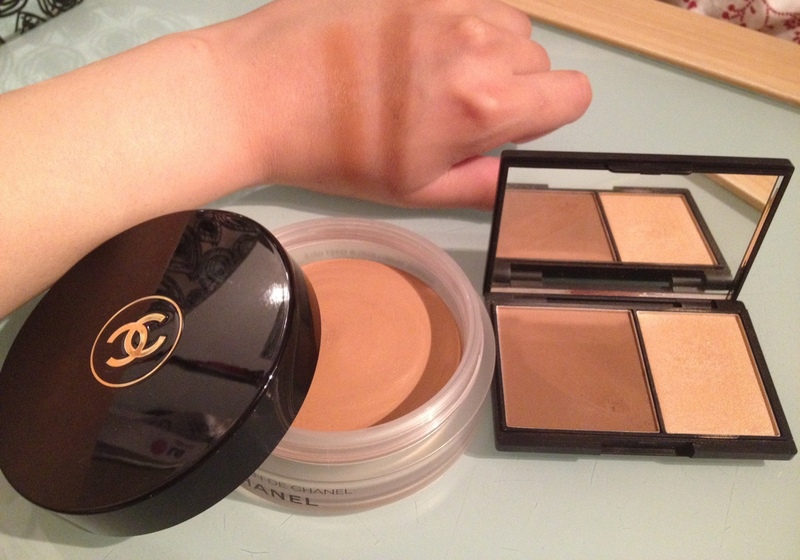 Chanel Vita Lumiere Aqua is one of my all time favourite foundations! Although I’ve been matched up to shade 40 (WAY too dark), it’s perfect for when I bronze up a but with some fake tan! I love this foundation because it makes your skin look healthy, feels amazing on the skin, smells good and glides on beautifully! I think the best thing in foundations is when they blend like a dream because it’s used all over your face, so if it doesn’t blend, it’ll look awful! Always look for samples for sample for high end products! Don’t be afraid to ask! If you’re about to pay £30 for a foundation, you want to make sure it’s worth it! If you’re at a drugstore, test the product! In the UK this is easier as we get testers but in the US, look for reviews on the Internet!